April 21-24th the Artists of Fine Art Maya will be at the worlds largest art trade show, Artexpo New York being held at Pier 94. The event kicks off with a special Opening Night Preview Party on Friday, 4-7 pm. For four days every spring, attendees get an inside look at the innovations of more than 400 artists and galleries worldwide as they showcase their latest works. In the Artexpo Pavilion, you’ll see established studio artists and galleries featuring thousands of paintings, glassworks, mixed media, and more. Then there’s [SOLO], a section for emerging independent artists, and [FOTO SOLO] for independent fine art photographers. One ticket. One venue. Three amazing shows. Don’t miss this captivating event! Artexpo is the world’s largest art trade show and has proudly hosted the likes of Andy Warhol, Robert Rauschenberg, Keith Haring and Leroy Neiman during long history. This years event will run Friday through Monday, April 21–24, 2017. As always visitors should anticipate huge crowds of art lovers, collectors and creators. For thirty-nine years and counting, Artexpo has been changing the way people buy and sell art. The annual, juried expo brings the biggest publishers, galleries and collectors face to face with hundreds of established and emerging artists. 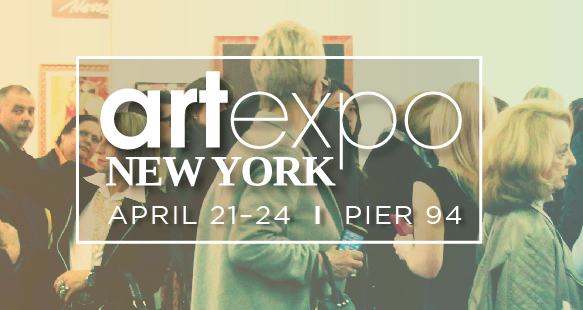 This year, Artexpo will host over 400+ innovative exhibiting artists, galleries and publishers from across the globe, showcasing exciting original artwork, prints, paintings, drawings, sculpture, photography, ceramics, giclee, lithographs, glass works and more—all under one roof at Pier 94. Pier 94 enjoys a prime location and established prestige in the New York convention and special event landscape. Often referred to as the unconventional convention center, Pier 94 offers 135,000 square feet of uninterrupted convention space in an airy venue for art exhibitions and trade shows. Over the past several years, Pier 94 has quickly become a recognizable event space in New York City, utilized for high end shows and large scale events. 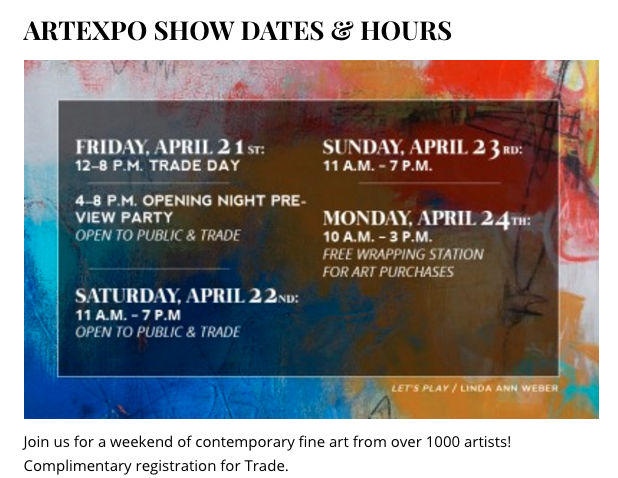 DATES & TIMES: WHAT’S HAPPENING EACH DAY AT ARTEXPO? Get the first look at this year’s show! Open to all trade buyers, including gallery owners, dealers, designers, architects, consultants, and art-industry associates. Opening Night at Artexpo! See dazzling art, attend educational seminars, and enjoy cocktails, hors d’oeuvres, live entertainment, and special events. Open to trade buyers, RMG VIP Card holders, invited guests, and the public. Spend the day perusing artwork from thousands of international artists and enjoy inspiring art talks, Meet the Artist events, and live demonstrations. Enjoy the last moments of the world’s largest fine art show and save $10 on admission! Monday only, we’ll have a complimentary wrapping station—choose a new piece for your collection and we’ll wrap it up for you. Open to everyone for just $10 admission. Get directions to Pier 94. Images: All event photos/screenshots property of Artexpo New York .